Happy New Year everyone! Like every other self-respecting Tarot reader, I threw a spread for the new year (it would be interesting to do an astrological chart reading for this day, but alas, my skills are not yet strong enough). So, what might the upcoming year look like? I considered doing my Personality Spread for this, but instead opted to go with the more traditional Celtic Cross, as I am not interested so much in the New Year’s personality as in what it will look like, what I should watch out for, and the like. So, here we are, using my Thoth deck. The question asked: What might the upcoming year look like, and what things should I look for or do in the coming year, both on a universal and a personal scale? The central, defining element of the New Year, it seems, will be Gain. 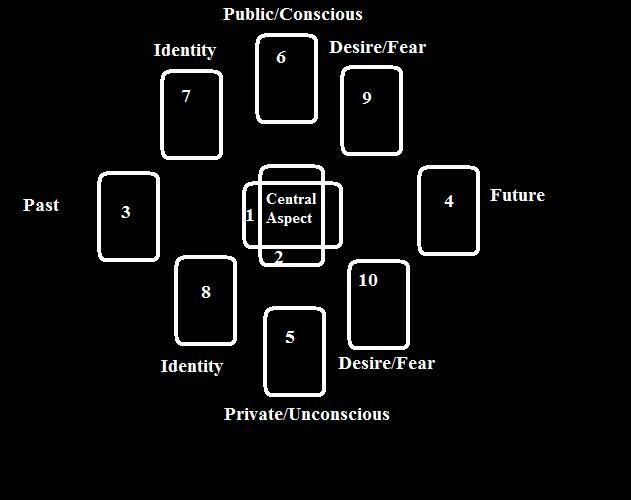 The Nine of Disks represents material gain and fulfillment in terms of one’s material needs. This seems to indicate that in the upcoming year, my labours (whatever they might be) will be rewarded and will result in material advantages, which in turn encourages me to work harder this year in order to maximize these gains. I’ve been looking for a paying job of some kind for a while; maybe this year I will find one. Or, perhaps, the books that I’ve written will finally start making me money. On a larger scale, perhaps the work of the world will also come to fruition and will bring material advantages. The first thing that comes to mind for me is the Occupy Movement (in case this wasn’t obvious); perhaps their work will yield material advantages and a better distribution of wealth and a more fair system of gaining from one’s work. Coupled with the above card, this card suggests that perhaps gaining our material advantages won’t be particularly easy. There are hurdles to be overcome, and though it may seem hopeless, we need to power through everything that gets in our way in order to reap our rewards. The labours we perform in order to gain material wealth will be made harder by the influences of this card, and frustrations may abound as it seems that we are helpless to get what we want to get done done. This year, then, might be difficult for me in terms of my intense university workload this semester (and the beginning of my thesis next semester), and all of the little hurdles will add up to make getting these things done more daunting than they normally would be. Again relating this to the Occupy Movement, pretty much everyone will get in its way, especially big corporations and the GOP. It might seem hopeless to topple or change such an entrenched and wealthy system, and many things will stand in their way, but in the end there can be much gain in the material world from keeping the struggle alive. Together, the first two cards in this spread say that though it will be very hard, this year one’s work will also be well-rewarded and will manifest in material gain, despite interferences. Very interesting. I like to call this card the “tyrant” card. It is important to note here that I use the word in its original meaning, as a sort of dominating figure, which can be both positive and negative. This card in this position indicates that the direct influence of the tyrant is receding, but that her memory will linger on and affect our actions in the future. Again, let’s tie this to the Occupy Movement (this is really at the forefront of my mind)! The (negative) tyrant, in this case, is “Wall Street.” This card tells us that Wall Street’s influence might be receding – indeed, already, much of its legitimacy has been wounded by the movement. On a more personal level, this could also indicate the receding power of another tyrant in my own life (or rather, two of them, though they do not dominate me, but rather someone I care about), but I shan’t go into that here. Though perhaps asking too much, this card could also be indicating that the rule of strong, single personalities (particularly in political positions of power) will end, and community rule will once again return to the human race. The Queen of Wands is also an old, proud ruler, and the fact that her influence is receding indicates great change on the horizon, as reinforced by the influence of the future: Death. One of the Major Arcana that usually makes one draw breath, in this position I think Death is a positive card. Like I hinted at above, the fact that Death – symbolizing transformations and broad, sweeping changes, the end of the old and the beginning of the new – is coming in the future seems to indicate that society will be changed forever as a result of this year. 2012 is a momentous year if one listens to doomsayers who believe that the Mayan calendar predicts that the world will end this year. If that happens, then that certainly would be a drastic, sweeping change. If it doesn’t (which I really hope is the case), then the world still might change drastically. The fact that the card is Death, to me, indicates that these changes will be on a broad, sweeping scale, which (again!) to me points to the Occupy Movement and their (hopeful) toppling of the current, unfair, corrupt system in the world. This would fit the card very well, as that would very much be an example of the toppling of the old and bringing in the new. These changes will probably affect me on many levels (especially considering the careers I’m looking at – economic equality would be very beneficial here), and hopefully will improve the world and make it a better place. A very earthy year so far! The influence of the Ace of Disks, to me, seems readily apparent on some thought: the driving force behind many of the movements that began in 2011 (and are continuing on into this year) are material. The material unequal distribution of wealth, the desire to improve one’s own standing and quality of life; all concerns of the material. Perhaps these concerns will become more pronounced as we enter into 2012. An additional thing to consider is climate change; the world is heating up (this is not disputable, this is fact. Whether or not humans are the cause is up for debate for some), and it is possible the cause of all of the strange weather last year. This card could indicate that the influence of the Earth and her moods might have a powerful effect in the coming year, her actions unconsciously moving many people to act. Maybe the effects of climate change will become extremely apparent, moving more and more people to environmental movements, making Mother Earth a hidden, covert influence in the upcoming year. Interestingly, I was thinking of joining a Druidic group this year – again another attachment to the Earth, as represented by the Ace of Disks. On a personal level, this card indicates that perhaps these thoughts will influence my actions in the upcoming year, though I may not realize it. Maybe if I join a Druid Grove, they will begin to influence me in ways I could not imagine. Peace as a conscious influence in the New Year? That sounds nice. The United States has withdrawn from Iraq, and this year we will see how the country will react to the withdrawal. Perhaps this card offers a sliver of hope. Maybe the war in Afghanistan will end. Maybe the new leader of North Korea will reverse his recent violent speeches and threats, and will instead seek to help his people. Perhaps the upper classes of the world will end the class warfare that they began by oppressing those beneath them, and the war will become unnecessary. Perhaps what will drive the New Year forward is a desire for Peace, which may again lead to material gain as the violence that exists everywhere in the world ceases. Perhaps. On a more personal level, perhaps my own dark thoughts and problems I’ve had with… well, life, will finally be resolved and I’ll manage to attain some inner peace for once. I’ve been trying to consciously do that for a long time – it’s one of the reasons I study the esoteric arts. Maybe my labor here will be rewarded with gain (see what I did there)? Well, this card seems to be at odds with the rest of the reading. We have being rewarded for one’s work, moving out of the shadow of the tyrant, being driven on by the material forces and the quest for peace, and experiencing vast transformations in the world. Perhaps these changes might not all be positive; maybe we shall move from tyranny of the wealthy to the tyranny of the mob. Ruin, as represented by the Ten of Swords, is a result of an extreme disconnect between reality and one’s thoughts. Perhaps the Occupy Movement will succeed in the New Year, but not in the same way I had been hoping; my expectations might then fall flat on its face and I will perceive the movement as having come to ruin. On a more personal note, perhaps I will achieve the peace I have been looking for, but to others around me I might seem as having come to ruin; I have always had a different perspective on life than other people, and what I consider inner peace might vary drastically from what they would associate inner peace with (this position is, after all, also associated with how I express myself to the world). My sense of the world as being ruined might also define me in the upcoming year, and might drive everything I do. Perhaps, also, this card is telling me that I have become too detached from reality, and in the new year, the first hassle (from Interference) that I have to overcome is my abstract nature; perhaps I need to become more grounded and see the world as it really is, not just through my Airy mind. The second ten in this spread. Interesting. Tens in the Tarot are associated with the Sefirot of Malkuth, which is in turn associated with the Earth. This is a very Earthy year. This card also seems to indicate that the rest of the world sees me as being oppressed by the world; I certainly feel that way a lot of the time, and have expressed these sentiments to others. The world will continue to see me this way in the upcoming year. This position also tells of the influences the larger world will have on me; namely, I will be oppressed by it. Perhaps my feelings are not all that inaccurate, then; I will, in this year, become more of a victim of the flawed global economic system than I have been in the past. Completion. A sense of security, order, and celebration. Again, this card brings out the oddness of the previous two cards (perhaps they indicate what things will look like before Death’s influence becomes apparent). It tells me that what I hope for is security. For me, this will come in the form of a plan for my future, a way of maintaining independence from my parents, and some sense that when I go out into the job market, the flawed system out there won’t strike me down. I fear a lack of security and a lack of order, possibly as threatened by the movements across the world. I hope for a sense of completion within myself and with others; I have never been particularly social, and generally feel alone. Perhaps, this year, I should strive to make social connections with others, and go out and celebrate life with them, so that I can become part of a secure community, who can provide me with the order I also desire in my life (which has been surprisingly absent of late). Assuming the year goes as the rest of the spread indicates, 2012 will be defined by order as dictated by a higher force acting to combat chaos. It will also be defined by virility and energy. Combined with the rest of the spread, Death will come and make way for a new order as represented by the Emperor, rising from the ashes of the tyrant. This new order will provide me with security and help me break free of the feelings of ruin and oppression in my own life, and perhaps some sense of justice and fairness will return to the world under the Emperor’s guidance. I feel that in the material world, the Emperor’s influence will be felt as the unconscious, mass mind of the world, uniting to create their own order and justice in order to fix what has been going on up to this point. So, in conclusion? This year is a year to focus on the material and the practical, and get your head out of the clouds. Good things will come your way this year if you work hard, and overcome all of the obstacles that will be thrown at you. The old order will be abolished and swept away, and society and your life will transform into the something more ordered and just, driven by the powers of the earth and the search for peace. The oppression and feelings of despair will also help drive the world towards this coming momentous change, and hopefully, after said change, these feelings will stop. Happy New Year everyone and have a good 2012! Rabbit rabbit! This entry was posted on January 2, 2012 by Z. M. Wilmot. It was filed under Tarot .